There is a misconception that building your own home will be costly, but in many cases it is cheaper to build your own home than buy an existing one. Building your own home, also known as self-build, is the perfect way to create your ideal home, yet despite an appetite from consumers the self-build market has been constrained over the last few years. Research by one building society shows that some one in three Brits are considering building their own home in the next five years.While a further 30% of people would consider embarking on a self-build project in the next five years if the finance was available. The self-build market is currently worth approximately £1.9bn in the UK, but it still only makes up around 1.4% of the overall mortgage market. Some 15,000 people build their own home in the UK every year and if the government has its way this number will increase significantly over the next few years. The government has realised that the self-build market has the potential to help plug the housing gap in the UK and it is encouraging mortgage lenders to do more to help borrowers who want to build their own home. Housing minster Grant Shapps and the National Self-Build Association have recently launched a report into what can be done to encourage people into the self-build sector. The report, An Action Plan to Promote the Growth of Self-build Housing, was launched on July 21, 2011. It highlighted a number of hurdles for those trying to build their own property, such as a lack of finance from lenders and a scarce availability of land, as well as a need to improve existing legislation to make it easier for people to self-build. But the pros of self-build outweigh the cons, in that many new homes are not only more energy efficient and of better quality but they also add to the housing stock in the UK. The report proposed that local councils should be given more control of the land in their area. As it stands, each local council has a target in terms of how many new homes they must build over a five year period, but self-build is not factored into this. The government wants to see local authorities make more land available for self-build, making use of dilapidated barns and farmland.In order to do this the government is aiming to scrap certain building and planning regulations, which would make it easier for people to use current plots of land and build on them. Some local councils have already caught onto the idea of self-build and are piloting schemes and looking at land they can free up for self-build projects. If you are thinking about going into self-build your fist port of call should be your local council to see if they are running any schemes and have any land earmarked for self-build. Firms who supply self-build mortgages may also have access to plots that are up for sale. Mortgage lenders are also starting to become more comfortable with the idea of lending on self-build and many will offer up to 90% of your funds required and in some cases more. While nothing can be done to force lenders to offer this type of finance, the housing minister has written to many banks and building societies to asking them to free up more lending for this sector. There are currently around twenty lenders that offer self-build mortgages and these will not work in the same way as a conventional mortgage. Most lenders will offer the money in stages, allowing the project to make some headway before they give you more money. Most lenders will offer 75%-80% of the initial capital required upfront, which will normally be based on the value of the land you are purchasing. In most cases you will need a separate loan to cover the cost of building the property. After that, the loan is released in four further stages at various cycles in your self-build project. Throughout the process the lender will want to carry out checks to see that the building work is going to plan before they give you your next instalment. Most lenders will want a surveyor to examine your plans and planning permission before your start and may only limit their lending to specific types of properties, such as detached homes. If you are thinking about self-build it is important you visit the lender before you start your building work as this may affect how much they are willing to lend. 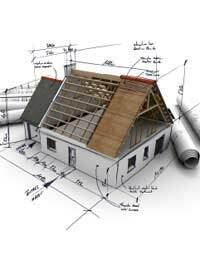 Self-build off course does have its drawbacks and the key to any successful self-build project is finding the initial plot of land, which can be a challenge in itself. The process of self-build can at times be drawn out and it goes without saying that it takes longer than buying a house the normal way, but with the government pushing to make the market more accessible the process of self-build should become easier and more affordable in the next few years.